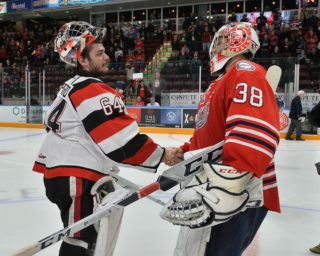 After their World Junior hopes were dashed in the last round of cuts last December, goaltender Michael DiPietro (Windsor Spitfires) and high-scoring centreman Nick Suzuki (Owen Sound Attack) have their sights set on roster spots once again. After watching their fellow countrymen win gold in Buffalo, defending Goaltender of the Year DiPietro and back-to-back Most Sportsmanlike Player Suzuki embark on the 2018 CIBC Canada Russia Series as likely candidates to play a part in Canada’s title defence this coming December in Vancouver, BC. For DiPietro, the opportunity is one he’s been focused on since word of last year’s late cut came down the pipe. His response to the disappointing news impressed Hockey Canada brass so much that he was included on Canada’s roster of the May 2018 IIHF World Hockey Championship in Denmark. Though he didn’t see game action, he had the opportunity to work alongside NHL stars in Connor McDavid (Edmonton Oilers/Erie Otters), Ryan O’Reilly (Buffalo Sabres/Erie Otters), Brayden Schenn (St. Louis Blues/Brandon Wheat Kings) as well as fellow goaltenders Darcy Kuemper (Los Angeles Kings/Red Deer Rebels) and Curtis McElhinney (Carolina Hurricanes). “I think being a part of the World Championships was a great way of propelling my summer forward and provided a stepping stone to really show me what it’s going to take to make the jump and play with guys of that calibre on a regular basis,” said DiPietro of the experience. “I’m grateful to Hockey Canada for the experience and that I was able to pick the brains of guys playing in the professional ranks. I really learned a lot. “Making the World Junior team is a big goal of mine for this season,” he added. 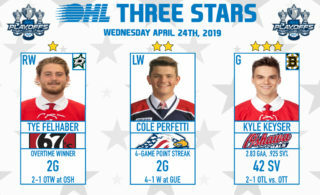 The Vancouver Canucks prospect is one of four goaltenders on the Team OHL roster, joining Luke Richardson of the Kitchener Rangers on November 8th in Sarnia before Los Angeles Kings prospect Matthew Villalta (Sault Ste. Marie Greyhounds) and 2019 NHL Draft prospect Hunter Jones (Peterborough Petes) take over in Oshawa on November 12th. 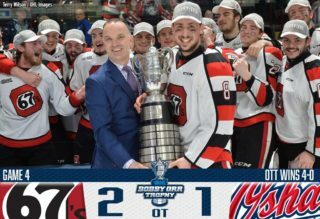 One of 17 OHL players including DiPietro and Villalta at Canada’s World Junior Summer Showcase in Kamloops this past August, Nick Suzuki remembers the heartbreak of being in the final round of cuts last December and feels he’s ready to take the next step. The London, Ont. native has had an interesting start to the season, being traded to the Montreal Canadiens on September 10th in a deal that saw star winger Max Pacioretty go back to the Vegas Golden Knights. The 13th overall pick of the 2017 NHL Draft has been productive with the Attack, recording 16 points (7-9–16) through his first 10 games of the season. 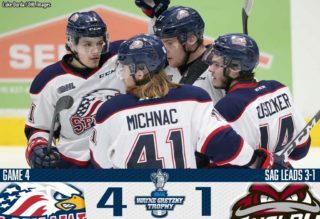 Suzuki, who will be in the lineup on November 8th in Sarnia, will be joined by Attack teammates Markus Phillips and Brady Lyle representing Team OHL. A total of 31 players will wear the OHL logo, with nine playing in both Games 3 and 4 of the series. Team OHL has split decisions against Russia in each of the past two years. The league holds an all-time record of 24-5-1 over the course of the 15-year event.